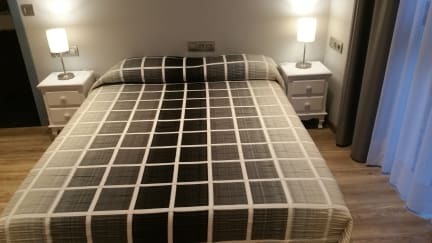 Hostal MiMi Las Ramblas, Barcelona, Hiszpania : Rezerwuj teraz! An unquestionable good situation in the heart of the city of Barcelona, which is surrounded by the best restaurants, bars, cultural and entertainment places! Our guesthouse is newly refurbished but with the essence and authenticity of the time and charismatic cultural environment. We have different rooms, from singles to the doubles with extra bed and have a philosophy fully responsive to all our customers' pets, which can leave safely always within our premises, while you enjoy visiting a museum or dining at a restaurant in town. Feel free to ask all kinds of recommendations that may be of interest when you visit us, we know many charming places nearby. Request whenever you want, also our taxi service and the confidence that we have spent many years working for you!